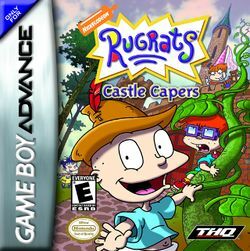 Rugrats: Castle Capers is an action-adventure game, that was developed by Software Creations for THQ and released upon the Game Boy Advance on September 24, 2001; as the name suggests, it is the twelfth title for the Rugrats series, and it sees the babies trying to get their toys back from "Queen Angelica" who has stolen them. Players will encounter many enemies in the game but since the main characters are babies they cannot pull off karate moves or anything similar - they must instead throw them an item of food which contains them for the babies to sneak past. There are a total of six levels altogether, and the last one (with a magic carpet) can only get unlocked by completing the other five. This page was last edited on 18 November 2016, at 10:00.